Why have we gathered here? One answer is to assemble together to show our love for God and for one another – because the whole of the Christian way can be summed up in these two commandments. But let us pause and recall that we do not always love God with our whole hearts nor our neighbors as ourselves. A Hindu proverb sums up the above: "The narrow-minded ask, 'Are these people strangers or members of our tribe?' But to those in whom love dwells, the whole world is one family." (Vasudhaiva Kutumbakam (Sanskrit: वसुधैव कुटुम्बकम. from “vasudha”, the earth; “iva”, is ; and “kutumbakam”, family) is a Sanskrit phrase that means that the whole world is one single family. Like last Sunday’s, today’s passage is built around a saying of Jesus. I would say about it what I said about last Sunday’s: it is a wisdom saying which the passage invites us to enter into with our feelings. Its truth should touch us so deeply that we are filled with gratitude, and also with humility as we realise that we do not live up to it – as individuals, as a Church and as communities. The saying then becomes a call to repentance. – this Sunday it is the wholeness which comes from recognising right priorities among our various obligations – “which is the greatest of the commandments”. Wholeness is presented in the form of a journey – we become whole by moving from fragmentation to wholeness. This is a crucial message for our times since fragmentation is one of the characteristics of our modern Western culture and the journey to wholeness one of its greatest challenges. Wholeness therefore defines our Christian mission today. Our special contribution to the modern world is to help ourselves and one another make the journey to wholeness – and this gospel passage shows us how this is achieved. The passage is addressed to us as individuals in our various vocations – parents, community leaders, ministers of Church communities, spiritual guides and counselors; it is also addressed to us as the Church of our time. As always we read Jesus’ saying, not merely as theory, but as testimony also. This was how he looked on life at this crucial stage of his journey, when he was in Jerusalem, facing the wrath of “the chief priests and elders” (mentioned explicitly on two previous Sundays), arrest and crucifixion. A good approach to interpreting the passage is to start with Jesus – what was in his mind when he said this? So too a sign that we have made a good meditation is that we celebrate Jesus (and all the people like him) who have touched our lives. The Pharisees and the Sadducees represent the fragmentation which Jesus rejected – and calls us to reject – in favour of wholeness. As we saw last week, a sign that we have made a good meditation is that we feel compassion for them – we know where they are coming from. – ourselves– the “law and the prophets”. Let us look at each stage of the movement. We often find ourselves stressed by our many obligations. One day we realise our root problem: we have allowed obligations to become important in themselves, whereas they are important only because they are linked to a basic obligation – our commitment to God, the centre of all our lives. We celebrate that moment of insight. In our meditation we must make sure to interpret “love” concretely. In our culture it has become vague – meaning many things and therefore nothing very precise. We need then to give it some “body” – meaning such things as “surrender ourselves to”, “put our trust in”, “choose to please”. “All your heart, all your soul, all your mind”: we do not have to give each of these a separate meaning. A cumulative effect is intended – “your whole self”. The real stress is on “all” which means in the concrete “more than to any person, thing or cause”. We celebrate the Jesus (person, community, event, bible text, natural phenomenon) who led us to this wholeness. An important area of fragmentation in our modern Western culture is individualism. This concept, which is at the heart of most modern institutions, says that our first obligation as human beings is to look after ourselves. Individualism affects the whole gamut of human relationships – between individuals, nations, ethnic groups, religions etc. It has even affected the life of our church. In Jesus’ time “the law and the prophets” referred to the Jewish ancestral tradition. We interpret it today of our own cultural traditions. The saying celebrates a time when we experience them as perfectly fulfilled (“hanging together”) in Jesus. This saying then rejects another source of fragmentation in our modern world (one which our Church has contributed to) – the concept that Western culture is superior to others. A sign that the people of Africa, Asia and Latin and Native America have come to “love” the Father of Jesus is that they reverence their “whole law” and their “prophets”. Like last Sunday’s saying, this one is presented in the context of a story and identifying with the different characters can help bring the story to life for us – always on condition that we don’t look down on them but identify with them. As we have seen, the Pharisees and Sadducees represent us at the beginning of our journey to wholeness. We can however focus on the fact that they “got together” for the purpose of “disconcerting” Jesus; this is significant because the Pharisees and Sadducees were usually at odds. They therefore represent us when we are afraid to make the journey to wholeness and ally ourselves with anyone who will collaborate with us in running away from it. – the Sadducees were conscious of their standing in society and wanted to preserve it at all costs. 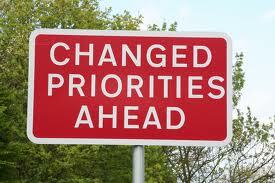 Confronted with them, Jesus remains clear and focused because his priorities are right. * we have studied the background to the books of the bible. Like the Sadducees, we have influence in society and know how to exercise power. and there is always some expert who disagrees with what we decide to do. Thank you, Lord, for sending us Jesus. * that if we seek your will only, we end up loving others and doing what is best for ourselves. Then suddenly all the many laws and prophets fall into place. and ever since we have been able to put laws and prophets into proper perspective. to seek prosperity for our immediate families and for our countries. with whom we do not normally associate. and that all laws and prophets must fall into line with this teaching. Why have we gathered here? One answer is to assemble together to show our love for God and for one another – because the whole of the Christian way can be summed up in these two commandments. But let us pause and recall that we do not always love God with our whole hearts nor our neighbours as ourselves. 1. How do we learn to be Christians? The answer is that we have to learn to behave in a particular way: the way of love. It was to establish the community that would live in this way that Jesus was sent to us by the Father; and it is to be the people who live in this way that we are called to belong to the church today. 2. You shall love the Lord your God with all your heart, and with all your soul, and with all your mind; and you shall love your neighbor as yourself. 3. This is what is commanded to each of us; but it is given as the greatest commandment of ‘The Law’ – and The Law was the most valuable possession of a community, a people. We are each called to love God and neighbour, but we do this not as loners but as part of a community. Then, with each practising love of God and neighbour, the community will be like a transmitter showing the love of God and the new way of life he calls us to live to all around us. 4. People should be able to spot us as Christians by the way we live long before they have found out what beliefs distinguish us. It is always difficult when people ask us to put a list of items in order of preference. For example, deciding whether we like chocolate more than mints, or apples more than oranges, could take hours. Often in arguments, our opponents might pose a range of options which is almost impossible to answer, such as: Which is greater, your love for your spouse or your love for your children? This is what the Pharisees thought they were doing when one of them, a doctor of the law, asked Jesus: ‘Which is the greatest commandment of the Law?’ (Mt 22:36). We learn that, in asking this question, the Pharisee was trying to disconcert Jesus. So the Pharisees were hoping that, somehow, Jesus would make a mistake and say something that was incompatible with and offensive to the Jewish religion. Then they could use that against him. They were jealous of his popularity with the crowds and they knew that they were dealing with a formidable teacher who could quote and explain the scriptures expertly. Surely now, they were thinking, Jesus would fall into the error of belittling at least some of God’s commandments by exalting one over another? We have probably all been in situations like this in discussions and debates, when we have been hard pressed to offer a satisfactory answer without compromising the faith or moral teaching in some way. Jesus’ reply was simple and direct. First, he emphasized the first and greatest commandment to love God with our whole heart, soul and mind. Nobody could argue against that. The Pharisees must then have been waiting, hoping that a mistake was imminent. 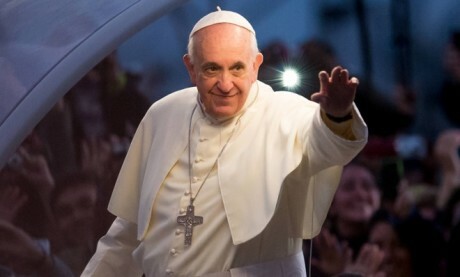 Pope Francis reaching out like Jesus did. Then Jesus added that the second commandment is like the first: ‘You must love your neighbour as yourself’ (Mt 22:39). Next Jesus achieved a masterstroke. Instead of leaving it at that and, perhaps, allowing the criticism that the other commandments (forbidding theft, murder and adultery) are not so important, he added: ‘On these two commandments hang the whole Law and the Prophets too’ (Mt 22:40). The cunning Pharisees must have been dejected. Not only did Jesus refute in advance any potential claim that he had diminished the importance of any of the commandments, but hc had included all the sayings of the prophets in his reply. The greatest of the commandments, which is to love God and neighbour, is the basis for every other law and every exhortation of the prophets who, over many centuries, had spoken about fidelity to God’s will. The challenge for us is to reflect carefully on Jesus’ defence ol the truth. He did not shy away from the questions posed by the Pharisees, although he knew that they were being mischievous and trying to trap him. Let us resolve to answer honestly and thoughtfully the questions about our faith that are asked by family, friends and colleagues. 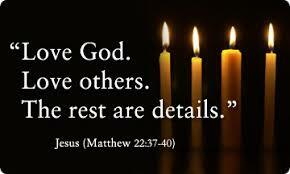 ‘To love God and love your neighbour7 – this is one of the most attractive of the sayings of Jesus. It is an encouragement to live fully with what brings the greatest joy in life – true love of God and the neighbour. It is at the heart of good religion, and what attracts many to Jesus. Bad religion puts law above love. Bad religion fights for the partial truth of religion. We risk being victims of bad religion, just as we can be victims of bad nationalism, bad psychology or any other bad way of living. Jesus’ life was to propose good reli­gion and to live by it. The religion of some of the Pharisees was bad, in that it was incomplete in its scope. We admire those who give energy in love and service. We are proud of people we know whose lives make a great and good difference to others. We know that our family and neighbour­hood, parish and school, workplace and leisure time have been enriched by the self-sacrificing love of many people, young and old. ‘He gave it his all‘ – we say that of a good player at the end of a match. We say of parents that they “were always there for the children. May we give all we have in our lives, giving in love, knowing that all we give is itself a gift from God, the giver of all good gifts. In this Sunday’s Gospel, as in last Sunday’s, the Jewish leaders seek to trip Jesus up. The question the lawyer poses was much discussed in rabbinical circles: Which is the greatest commandment? The Pharisees’ intention in posing the question was to force Jesus into a single rabbinical school, thereby opening him up to criticism from all other sides. Jesus’ answer, however, proves his fidelity to both the Jewish tradition and to a spirituality that transcends the legal interpretations of the commandments: the “second” commandment is the manifestation of the first. If we love the Lord God with our whole being, that love will manifest itself in our feeding of the hungry, our sheltering of the homeless and our liberating the oppressed. Jesus’ command to love our neighbor means seeing one another as we see ourselves: realizing that our hopes and dreams for ourselves and our families are the same dreams others have for themselves and their families. Every one of us, at one time or other, is an alien, outsider, foreigner and stranger. The commandment to “love your neighbor as yourself” is not confined to our “own” people or to a list of specific situations, but should affect every relationship we have and every decision we make. As our society becomes more and more diverse, as science continues to make once unimaginable advances in all forms of technology, the ethical and moral questions we face become more complicated, difficult and challenging. The Great Commandment gives us the starting point for dealing with such issues: to love as God loves us – without limit, without condition, without counting the cost, completely and selflessly. In our e-connected existence, the words of Jesus in today’s Gospel are especially challenging: to love with our whole heart and soul and mind requires us to “unplug” and be present to one another, to engage one another as our loving God is engaged with us, to seek not just images and perceptions of compassion but behold compassion and experience love in one another. An eight-year-old boy had a younger sister who was dying of leukemia. His parents explained to him that she needed a blood transfusion and that his blood was probably compatible. They asked if they could test his blood. Sure, he said. The results showed that his blood would be a good match. Then they asked the boy if he would give his sister a pint of blood, that it could be her only chance at living. He said he would like to think about overnight. The next day he went to his parents and said he was willing to donate his blood to his sister. So they took him to the hospital where he was put on a gurney beside his sister. Both of them were hooked up to IVs. A nurse withdrew a pint of blood from the boy, which was then put into the girl’s IV. The boy lay on his gurney in silence while the blood dripped into his sister. Every word of the Gospel comes down to love – love that is simple enough to articulate but so demanding that we shy away from it. The mystery of God’s love is that the Being of Supreme and Omnipotent Power should love his creation so completely and so selflessly – and all God seeks in return is that such love be shared by his people throughout his creation. The little brother, thinking that giving his blood would mean he would die, nonetheless is willing to give his life to his sister so that she might live; in his generosity, he models the great love and compassion of the God who spares nothing to bring us to him. May we seek to follow the great commandment of the Gospel: to love with the same selfless compassion, care and completeness of God. There is a legend handed down from the early Church about John, the beloved disciple of Jesus. Of the twelve original apostles, only John is said to have lived to a ripe old age. In his later years, not only his body but also his eyesight and his mind began to fail him. Eventually, according to the legend, John's mind had deteriorated to the point that he could only speak five words, one sentence which he would repeat over and over. You can imagine the high regard in which the early Church must have held the last surviving apostle of Jesus. The legend says that every Lord's Day, John would be carried into the midst of the congregation that had assembled for worship in the Church at Ephesus, where John spent the last years of his life. Total silence would fall over the congregation, even though they already knew what John was going to say. Then the old man would speak the words, "My children, love one another." Over and over, he would repeat them until he grew tired from talking, and no one yawned or looked at his watch or gazed off into space absentmindedly. They listened as John preached his five-word sermon over and over: "My children, love one another." One Sunday the pastor was finishing up a series on marriage. At the end of the service he was giving out small wooden crosses to each married couple. He said, "Place this cross in the room in which you fight the most and you will be reminded of God’s commandment of love and you won’t argue as much." One woman came up after the service and said, "You’d better give me five crosses." “After fifty years, I’m tired of you too,” she replied. 1) "Yes," said God, "but not in My lifetime." You may not know it, but years ago Nikita Khrushchev, John F. Kennedy and Golda Meir had a summit meeting with God. Each of them was allowed to ask one question. "God," asked Nikita Khrushchev, "do you think the U.S. and Russia will ever have peace?" "Yes," answered God, "but not in your lifetime." Then Kennedy spoke. "God, do you think there will be peace between blacks and whites in our land and around the world?" "Yes," replied God, "but not in your lifetime." Then it was the Israeli leader's turn. "God," she asked, "do you think there will ever be peace between the Jews and the Arabs?" "Yes," said God, "but not in My lifetime." Do you get the feeling, sometimes, that if there is a third World War, it will not be over politics or over economics? Rather, it will be over religion as it was in the Middle Ages when much of the killing and torture and hatred in this world was done in the name of religion. Today’s Gospel describes a confrontation between Jesus and the religious fanatics of his day. THERE IS NO SUCH THING AS A HOLY WAR. The two words are a contradiction in terms. Love of God and love for neighbor are oars of the same boat. Hasidic Rabbi Levi Yitzhak of the Ukraine was fond of saying that he had learned the true meaning of love from a drunken peasant. While visiting the owner of a tavern in the Polish countryside, the rabbi overheard the conversation of two men seated at a nearby table. Both had had a fair amount to drink and both were feeling quite mellow. With their arms around one another, they were professing how much each loved the other. Suddenly, the older of the two, Ivan, looked at his friend and asked, “Peter, tell me, what hurts me?” Bleary-eyed but slightly sobered by such a question, Peter looked at Ivan and answered with a question of his own: “How do I know what hurts you?” Ivan’s response came quickly. “If you don’t know what hurts me, how can you say you love me?” In today’s Gospel Jesus teaches us that the most important commandment is to love God living in others. "In the most striking finding, Dr. Harold Koenig of Duke University Medical Center has calculated that, with regard to any mainstream Faith, ‘lack of religious involvement has an effect on mortality that is equivalent to 40 years of smoking one pack of cigarettes per day. '” Further, "Another new study, conducted mainly by researchers at the University of Texas, found that those who regularly attended worship services lived an average of seven years longer than those who never attended." (The New Republic (July 19 & 26, 1999). Cited at tim@cybersalt.org (Tim Davis).) What can I say? Listening to me each week is good for you! A healthy bank account and a healthy body will take you a long way in our society. And if you have both, you are blessed indeed. But neither will bring you any comfort if your own children hate you. Neither will suffice for companionship if your neighbors avoid you. There are plenty of lonely, rich, old people in this world who would give anything to be loved. YOU AND I WERE CREATED FOR RELATIONSHIPS. It is built into every fiber of our being. 4) “Did you ask a good question today?" Isidor Isaac Rabi, a Nobel Prize winner in Physics, and one of the developers of the atomic bomb, was once asked how he became a scientist. Rabi replied that every day after school his mother would talk to him about his school day. She wasn't so much interested in what he had learned that day, but how he conducted himself in his studies. She always inquired, "Did you ask a good question today?" "Asking good questions," Rabi said, "made me become a scientist." In order to ask a good question I think you need to have noble motives behind the question. You have to want to know the truth. The Pharisees, by contrast, already had the answers to their questions. They felt they already knew the truth. The Pharisees come to Jesus once again with a question designed to do damage to the reputation of Jesus. In our nation's archives there is an account of two ladies from Tennessee who came before President Abraham Lincoln at the conclusion of the Civil War. They were asking for the release of their husbands held as prisoners of war at Johnson's Island. Lincoln put them off until Friday, when they came again. Again the President put them off until Saturday. At each of the interviews one of the ladies stressed to Lincoln that her husband was a religious man. After the Saturday interview the President ordered the release of the prisoners. Then he turned to this lady and said, "You say your husband is a religious man. Tell him when you meet him, that I say I am not much of a judge of religion. In my opinion, however, the religion that sets men to rebel and fight against their government is not the sort of religion upon which people can get to Heaven!" I think Abe was a pretty good judge of religion. Any religion that tells me that I can hate or exploit or mistreat any person regardless of their race, nationality or religion is not the kind of religion upon which people can get into Heaven. Love for God, love for neighbor. They must forever be one (Gerard Fuller in Stories for all Seasons). Actor Christopher Reeves had everything--wealth, fame, fabulous health. He was one of the most handsome, physically fit men in Hollywood. Then he fell from a horse. And suddenly he was a quadriplegic. When he awoke from his accident, his first thought was that maybe he should go ahead and die. But one thing stopped him and gave him the will to live. His wife, Dana, spoke to him firmly, yet gently. "I am only going to say this once," she said. "I will support whatever you want to do, because this is your life and your decision. But I want you to know that I'll be with you for the long haul, no matter what. You're still you, and I love you." Those words gave Christopher Reeves the strength to go on. [Jack Canfield, Mark Victor Hansen, Mark & Chrissy Donnelly, and Barbara DeAngelis, Ph.D. Chicken Soup for the Couple's Soul (Deerfield Beach, FL. : Health Communications, Inc., 1999), pp. 104-105.] There are times in life when all of us wonder where we will find the strength to go on. Maybe it will come from a spouse, or our offspring, or a friend. Other people are a great source of consolation and comfort. But there will come a time when all of us will have to lean on our ultimate Friend, God. There will be no one else who can help. And why shouldn't we turn to God? This is that for which He created us --relationships. One day Ron was serving a hot meal at a soup kitchen. They were serving chili with two pieces of buttered bread on that particular day. A man came through the line who looked even more scruffy and broken than the others. Ron was overwhelmed by his stench. "Like the pull of a magnet," Ron recalls, "my gaze went to the dirt and dried blood on his hands." Before he realized what was happening, the man clasped Ron's hand in both of his. "Brother," said the scruffy man, "I love you. Thanks for being here." "I'm glad you came," Ron replied after swallowing hard. Ron tried to smile as the man shuffled over to one of the tables with his meal. The next man stepped up. As Ron handed him a bowl of chili, a little of the chili spilled on Ron's hand. Without thinking he licked it off. Then it hit him. That was the hand the other man had just clasped! Ron momentarily froze, repelled to think that he had licked something that smelly, dirty man had just touched. It was a moment of revelation for Ron. "The light of awareness changed my vision and my heart warmed with new understanding," Ron says. "No longer was Jesus only the handsome man I had pictured in my mind and seen in paintings," he continued. "Now he had a scarred, stubbled face and fingers stained yellow; he was dirty, he smelled bad, and he wore cast-off clothes. I had just served him chili and bread." [Ron DelBene, From the Heart (Nashville: Upper Room Books, 1991), pp. 32-33.] There's a reason we are to love our neighbor as ourselves. When we love God with all our heart, soul, and mind and love our neighbors as ourselves, we experience the risen Christ. Charles L. Allen, in God's Psychiatry, tells about a scene from Amos and Andy. "There was a big man who would slap Andy across the chest whenever they met. Finally, Andy got enough of it and said to Amos, 'I'm fixed for him. I put a stick of dynamite in my vest pocket, and the next time he slaps me, he is going to get his hand blown off.' Andy had not reasoned that at the same time he would get his heart blown out." 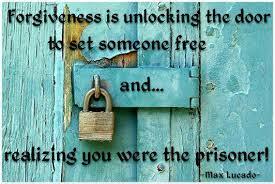 When we refuse to love our neighbor, we blow out our own heart. It all goes together. The brotherhood of people can become a reality only when we have the fatherhood of God. In an average year in the United States, 22,000 people kill themselves, and 100,000 more try. The real cause for such attempts, say the psychiatrists, is a sense of guilt and a desire to punish oneself. 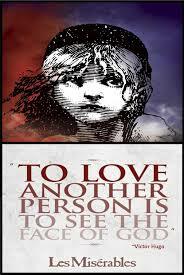 G. K. Chesterton says the great lesson of "beauty and the beast" is that a thing must be loved before it is loveable. If we are God's creation, and if we are created like God because He loves us, we must think well of ourselves. We are well-made, we are God's handiwork and we are created like our Creator. There is an important message here - we are to love ourselves. In a day when self-worth is low, in a time when so much introspection is encouraged, and when human nature is looked at with suspicion, we need to say boldly - we are God-made! And let's remember, God makes us well. It would be blasphemy to hate ourselves, since God is our Creator. An old Russian woman lay on a sofa. Multiple sclerosis had twisted her body almost beyond recognition. The simplest tasks had become almost impossible for her. Corrie Ten Boom visited her at night, using the cover of darkness to escape detection by the Lithuanian authorities. Corrie kissed the woman's wrinkled cheek. The old woman could respond only by rolling her eyes and smiling because the atrophied muscles in her neck would no longer allow her to move her head. The only part of her body she could still control was her right hand. With her gnarled knuckles she stroked Corrie's face. Corrie reached up to take her hand, and kissed her index finger--for a special reason. The routine was the same every morning as the old lady's husband propped her into a sitting position on the sofa. A battered old typewriter was placed on a little table in front of her. Every day the old woman would begin to type. She could only use that one index finger to peck out the letters. This woman served God by translating Christian books into Russian. It was slow going--sometimes only typing a page or two a day but this was her way of loving God. She typed portions of the Bible as well as some of the books of Billy Graham and other Christian witnesses. The woman's attitude was extraordinary. She saw her sickness as a prerequisite, not a detriment, for the work she did. Every other Christian in the city was watched by the secret police. But because she had been sick for so long the police took no interest in her, and she could work undetected spreading the Good News of Jesus to a people who were starving for good news. "Not only does she translate these books," her husband told Corrie, "but she prays while she types. Sometimes it takes a long time for her finger to hit the key, or for her to get the paper in the machine, but all the time she is praying for those whose books she is working on." [Annie Chapman, Smart Women Keep it Simple (Minneapolis: Bethany House Publishers, 1992), pp. 151-152.] That's loving God. There is a Jewish story about a Mr. Kleinman who finds himself alone in a strange town on the Sabbath. He goes to the local synagogue. After services, a Mr. Putterman comes over and invites Mr. Kleinman to be his guest for the evening. They go to Mr. Putterman's home. Mr. Kleinman takes a beautiful hot bath with scented soap, and dries himself with fluffy towels. They have a delicious meal. Afterwards Mr. Kleinman falls asleep on a comfy bed with fresh sheets. In short, for the entire Sabbath the Puttermans treat Mr. Kleinman like royalty. Now, it's time to go. Mr. Kleinman says, "This was a delightful Sabbath. Thank you so much. What can I do to repay you?" And Mr. Putterman presents Mr. Kleinman a bit of paper on which is written: "Warm bath, six dollars. Two cakes of soap, four dollars. Clean towels, three dollars. Full dinner, twenty dollars. Overnight lodging, forty dollars. Fresh sheets, three dollars. Total: Seventy-six dollars." "You're charging me?" asks the incredulous Mr. Kleinman. "Certainly," replies Putterman. "But you invited me!" Kleinman protests. " I was your guest! I've never heard of such a thing! This is outrageous!" "Nevertheless, if you could just settle up," says Putterman. "I will do no such thing!" Kleinman responds. "All right," sighs Mr. Putterman. "Let's not argue. Let's take this case to the rabbi and let him decide." "That suits me fine," says Kleinman and off they went to the local rabbi. In the Rabbi's study Kleinman lays out his case. The rabbi listens and strokes his beard. When Kleinman finishes he asks Putterman, "Do you have anything to add?" "No," says Putterman, "It happened exactly as Mr. Kleinman described." "In that case," says the rabbi, "based on numerous Talmudic precedents and on similar cases found in the Reposa, it is my decision that Mr. Kleinman should pay Mr. Putterman." Kleinman is dumbfounded. Still a rabbi had heard, a rabbi had considered and a rabbi had reached a decision. The two men thanked the rabbi and left. Outside, Mr. Kleinman begins counting out his money. "What are you doing?" asks Putterman. "I'm going to pay you," says Kleinman. "Don't be foolish," says Putterman. "You were my guest. I was honored to have you spend the Sabbath with me. I hope you'll come again." "But you gave me a bill," says the confused Kleinman. "We had a dispute, a decision was rendered." "Oh, that!" says Putterman. "I just wanted you to see what kind of schmuck we have for a rabbi." (The Jewish Humor List, 5, pp. 140-41) The lawyer who came to Jesus probably didn't really want to know Jesus' views on the great Commandment. He simply wanted to show him up as a schmuck, as a fraud. Imagine how surprised the lawyer was when Jesus answered his question in such a way that Jesus’ authority could not be denied. Arthur Godfrey, the radio and early TV star, used to keep a sign that read: '"The fire, Lord, not the scrap heap." He said the sign reminded him of a story about a blacksmith who suffered much illness but still maintained a strong Faith in God. When an unbeliever asked the blacksmith how he could keep trusting God in spite of his illness, he replied: “When I make a tool, I take a piece of iron and put it into the fire. Then I strike it on the anvil to see if it can take temper. If it does, I can make a useful article out of it. If not, I toss it on the scrap heap.” When we suffer because of love, we can rejoice because we know that God is using us (Mark Link in Sunday Homilies). 15) "You must be related to Him!" Just before Christmas, there was a boy who was wandering through a shopping complex. He was admiring the colorful display of the Christmas gifts. A lady closely watched him moving from one shop to another. Realizing the poverty of the boy, she took him inside the shop and showed him the Christmas tree and explained him about the meaning of Christmas. “God loves us,” she said, "And to save us from our sins. He was born in a manager as little babe.” Then she bought him a set of new clothes and a pair of shoes, along with some Christmas gifts and a candy and some refreshments. The little boy was thrilled. As she led him out of the shop, he looked at her and asked her, “Are you God?” “No,” she replied, “I am only one of His children.” “Ah! Said the boy, “I knew that somehow you were related to Him.” (John Rose in John’s Sunday Homilies; quoted by Fr. Botelho). In the time of the desert monks, there was an abbot by the name of Moses who had a great reputation for holiness. Easter was approaching, so the monks met and decided to fast the entire length of Holy Week. Having come to this decision, each monk went off to his cell, to fast and pray. However, about the middle of the week, two wandering monks came to visit the cell of Abbot Moses. Seeing that they were starving, he cooked a little vegetable stew for them. To make them feel at ease he took a little of it himself. Meanwhile the other monks had seen the smoke rising from the abbot’s cell. It could mean only one thing –he had lit a fire to cook some food. In other words, he had broken the solemn fast. They were shocked. And in the eyes of many of them, he fell from his pinnacle of sanctity. In a body they went over to confront him. Seeing judgment in their eyes, he asked, “What crime have I committed that makes you look at me like this?” “You’ve broken the solemn fast,” they answered. “So I have,” he replied. “I have broken the commandment of men, but in sharing my food with these brothers of ours, I have kept the Commandment of God, that we should love one another.” On hearing this, the monks grew silent, and went away, humbled and wiser. (Flor McCarthy in New Sunday and Holy Day Liturgies; quoted by Fr. Botelho). There was an article written in Time magazine years ago, about an airplane suddenly crashing into the sea. The writer claimed that it was one of America’s worst tragedies because of the large number of lives that were lost. It was also America’s hour of heroism. Immediately on hearing of the crash, several rescue operations were set into motion and the rescue workers, saved many survivors. There were several heroes who distinguished themselves that day by their life-saving action. The first heroes were the rescue workers, and when they were later interviewed on TV, they were asked one question: “Why did you risk your life?” They said that it was their job, and they were expected to do. These rescue workers perhaps symbolize people who will do things if it is their job. “If it is not my job then I will not lift a finger to help.” The second hero was one of the passengers, who was rescued and was being taken to the lifeboats. He noticed a lady drowning, dived into the waters, and pulled her to the safety of the lifeboat. When asked later why he had risked his life he replied: “She called out to me and asked for help so I had to help.” The hero could perhaps represent people who will do things if they are asked. “If you want my help, ask for it!” The third hero was also one of the passengers of the ill-fated plane. After the tragedy struck, he found himself floating among the debris. Fortunately, one of the rescue helicopters noticed him and lowered a halter, which he grabbed and held on to. He could easily have saved himself but he saw a young lady drowning and he quickly put the halter around her and the helicopter was able to rescue her. Soon the helicopter came again and once again the man grabbed the lifeline. Instead of helping himself, he looked around and noticed another old lady struggling and got the halter around her and she was rescued. Six times the man had a chance to save himself but six times he gave the lifeline to another, who, he felt, had a greater need. The seventh time when the helicopter came to the spot where the man had been floating, he was gone! History will never know who exactly this heroic passenger was, but he symbolized what Christ meant when he said: “Greater love than this no man has, than that he lays down his life for a friend!” (Quoted by Fr. Botelho). Father Damien: The Leper Priest is a movie made for television. The program dramatizes the story of Fr. Damien who came from Belgium to the Hawaiian island of Molokai in 1873 to serve the lepers there until he too contracted leprosy and died in 1889. At that time in history, the colony of Molokai was a dumping ground for lepers and it was like a death sentence to be put there. There was little law and order, medical help and supplies were non-existent, and housing and sanitation were so bad that the island seemed like a sewer. At first Fr. Damien found the lepers repulsive. But as he suffered with them, struggled with them and served them, he overcame his revulsion towards the lepers and developed deep feelings of love for them. Fr. Damien dedicated almost two decades of his life to the lepers because he believed that in doing so he was demonstrating both his love for God and for his neighbour. (Albert Cylwicki in His Word Resounds; quoted by Fr. Botelho). A man attending a crowded Church service refused to take his hat off when asked to do so by the ushers. The preacher was perturbed too, and after the service told the man that the Church was quite happy to have him as guest, and invited him to join the Church, but he explained the traditional decorum regarding men’s hats and said, “I hope you will confirm to that practice in the future.” “Thank you,” said the man. “And thank you for taking time to talk to me. It was good of you to ask me to join the congregation. In fact, I joined it three years ago and have been coming regularly ever since, but today is the first day anyone ever paid attention to me. After being an unknown for three years, today, by simply keeping on my hat, I had the pleasure of talking to the ushers. And now I have a conversation with you, who have always appeared too busy to talk to me before!” –What do we do to make strangers welcome? Are we too busy that you have no time to keep the greatest commandment? (Anonymous; quoted by Fr. Botelho). There is an immortal song written by an English poet, Leigh Hunt about a man named Abou Ben Adhem. Abou Ben Adhem woke from his sleep one night and saw in his room an angel writing in a book of gold the names of those who love God. “Is my name one of those in your book?” inquired Abou. “No, Not so,” replied the angel. “I pray you, then,” said Abou, “Write me as one who loves God’s fellowmen.” The following day the angel came again and displayed the names of those who love God, and Abou Ben Adhem’s name topped the list. This story makes the point that true love of God and true love of our fellowmen are two sides of the same coin. One cannot exist apart from the other. That is what we find in today’s Gospel. (John Pichappilly in The Table of the Word; quoted by Fr. Botelho). Years ago, there was a movie called Little Lord Fauntleroy. It was about a seven-year-old boy who went to live with his grandfather, a wealthy man who had many people working under him. The old man was basically selfish and mean. But the little boy idolized him so much that he couldn’t see this. He thought his grandfather was generous and kind. Over and over he would say to him, “Grandfather! How people must love you! I’ll bet they love you almost as much as I do.” The little boy’s love gradually softened the old man’s heart, and he became the kind of person his grandson thought him to be. This story is like a parable of Jesus. It shows how his love for us can change us and give us the power to become the kind of loving people he sees we can be. -Arthur Godfrey, the early TV star, used to keep a sign that read: 'The fire, Lord, not the scrap heap'. He said the sign reminded him of a story about a blacksmith who suffered much illness but still maintained a strong faith in God. When an unbeliever asked the blacksmith how he could keep trusting God in spite of his illness, he replied: “When I make a tool, I take a piece of iron and put it into the fire. Then I strike it on the anvil to see if it can take temper. If it does, I can make a useful article out of it. If not, I toss it on the scrap heap.” When we suffer because of love, we can rejoice because we know that God is using us. (Mark Link in Sunday Homilies). The first reading from the book of Exodus reminded the people of their obligations towards others, especially the widow, the stranger and the orphan. The time of the exile was definitely a very painful and dark part of the history of the people of Israel, during which they experienced what it meant to be weak and dependant on others. Times were better now but they were asked not to forget what they themselves had undergone and be sensitive to the needs of the foreigners among them, the homeless, the helpless and the dependant. Having felt the pain of injustice and oppression themselves, they must never inflict pain on others. The health of a community can be measured by the way it treats such people. In the time of the desert monks, there was an abbot by the name of Moses who had a great reputation for holiness. Easter was approaching, so the monks met and decided to fast the entire length of Holy Week. Having come to this decision, each monk went off to his cell, to fast and pray. However, about the middle of the week, two wandering monks came to visit the cell of Abbot Moses. Seeing that they were starving, he cooked a little vegetable stew for them. To make them feel at ease he took a little of it himself. Meanwhile the other monks had seen the smoke rising from the abbot’s cell. It could mean only one thing –he had lit a fire to cook some food. In other words, he had broken the solemn fast. They were shocked. And in the eyes of many of them, he fell from his pinnacle of sanctity. In a body they went over to confront him. Seeing judgement in their eyes, he asked, “What crime have I committed that makes you look at me like this?” “You’ve broken the solemn fast,” they answered. “So I have,” he replied. “I have broken the commandment of men, but in sharing my food with these brothers of ours, I have kept the commandment of God, that we should love one another.” On hearing this, the monks grew silent, and went away humbled and wiser. Father Damien: The Leper Priest is a movie made for television. The program dramatizes the story of Fr. Damien who came from Belgian to the Hawaiian island of Molokai in 1873 to serve the lepers there until he too contracted leprosy and died in 1889. At that time in history, the colony of Molokai was a dumping ground for lepers and it was like a death sentence to be put there. There was little law and order, medical help and supplies were non-existent, and housing and sanitation were so bad that the island seemed like a sewer. At first Fr. Damien found the lepers repulsive. But as he suffered with them, struggled with them and served them, he overcame his revulsion towards the lepers and developed deep feelings of love for them. Fr. Damien dedicated almost two decades of his life to the lepers because he believed that in doing so he was demonstrating both his love for God and for his neighbour. A man attending a crowded church service refused to take his hat off when asked to do so by the ushers. The preacher was perturbed too, and after the service told the man that the church was quite happy to have him as guest, and invited him to join the church, but he explained the traditional decorum regarding men’s hats and said, “I hope you will confirm to that practice in the future.” “Thank you,” said the man. “And thank you for taking time to talk to me. It was good of you to ask me to join the congregation. In fact, I joined it three years ago and have been coming regularly ever since, but today is the first day anyone ever paid attention to me. After being an unknown for three years, today, by simply keeping on my hat, I had the pleasure of talking to the ushers. And now I have a conversation with you, who have always appeared too busy to talk to me before!” –What do we do to make strangers welcome? Are we too busy? God-Jesus is love. Jesus’ bent body to wash feet and bloody body, crucified, are supreme symbols of love. Champaben, a poor tribal widow of Kanaghat village, south Gujarat, taught me quite literally what ‘mad love’ is all about. Her teenage son Manoj, is severely mentally handicapped. To allow her to care for her two small daughters, we had Manoj into an institution for mentally challenged. A day later Champaben returned, weeping, “Father, I’m sorry! I can’t live without my Manoj. Please bring him back!” And to this day, despite Manoj’s violent behaviour and screams, Champaben lovingly cares for him. Love is service and sacrifice. There is an immortal song written by an English poet, Leigh Hunt about a man named Abou Ben Adhem. Abou Ben Adhem woke from his sleep one night and saw in his room an angel writing in a book of gold the names of those who love God. “Is my name one of those in your book?” inquired Abou. “No, Not so,” replied the angel. “I pray you, then,” said Abou, “Write me as one who loves God’s fellowmen.” The following day the angel came again and displayed the names of those who love God, and Abou Ben Adhem’s name topped the list. This story makes the point that true love of God and true love of our fellowmen are two sides of the same coin. One cannot exist apart from the other. That is what we find in today’s gospel. In all things may love be the guiding light of our lives! Isidor Isaac Rabi, a Nobel Prize winner in Physics, and one of the developers of the atomic bomb, was once asked how he became a scientist. Rabi replied that every day after school his mother would talk to him about his school day. She wasn't so much interested in what he had learned that day, but how he conducted himself in his studies. She always inquired, "Did you ask a good question today?" "Asking good questions," Rabi said, "made me become a scientist." In order to ask a good question I think you need to have noble motives behind the question. You have to want to know the truth. The Pharisees, by contrast, already had the answers to their questions. They felt they already knew the truth. How many times have we had it in for someone, asking a question designed to trap them? We do it to our loved ones all the time. In a moment like this we are not trying to learn; we are trying to injure. The Pharisees come to Jesus once again with a question designed to do damage to the reputation of Jesus. And once again Jesus proves he is equal to the task. Teacher, which commandment in the law is the greatest? Now, even though this question was used to test Jesus, it is nonetheless an important question. Perhaps in the life of Israel at that time it was THE most important question. But Jesus had a question of his own. A question, which signified that the times were changing; a new theological season had come. He put this question to the same Pharisees who had tested him: "What do you think of the Messiah. Whose son is he?" 1. Which Commandment Is the Greatest? 2. What Do You Think of the Messiah? Last week we spoke of the power of "first impressions." From a chronological standpoint, Paul's "First Letter to the Thessalonians" was his first written words that have come down to us. It is the "first impression" of a life of Jesus discipleship written in the New Testament. In this week's gospel text from Matthew, we have a kind of closing bracket to that "first impression," a bookend "final impression," a last word from Jesus to the various Temple authorities. We have the third and final confrontation with those whom Jesus encountered as soon as he entered Jerusalem for his final visit into the Temple in Jerusalem. His first encounter was with the Herodians (who were egged on by the Pharisees) when he was grilled about the question of paying taxes to Rome. His second encounter was with the Sadduccees where his views on resurrection and eternal life were sized up and audited. 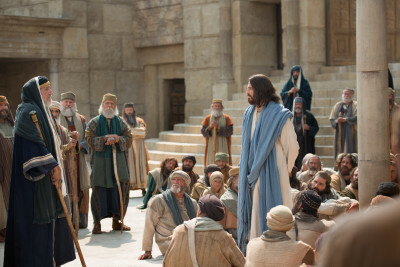 Now in this third encounter Jesus is confronted by what appears to be an organized, formal assembly of Pharisees. These were those Jewish authorities who were most devoted to imbedding the force and focus of written Torah law into the fabric of every jot and tittle of everyday life. The Pharisees had cataloged a list of 613 commandments or laws, which all faithful Jews should follow. But these 613 laws were also divided into those that were "weighty" and those that were "light." "Thou shalt not commit murder" was one of the "Big Ten." 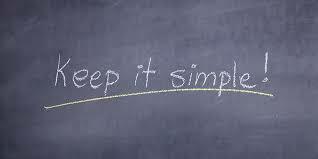 Written by the hand of God on stone at Sinai, this commandment was definitely weighty. Making a fire on the Sabbath, striking up some firelight, that was definitely "light," and in an emergency, absolutely expendable. The Pharisees' question to Jesus was tried to get him to name which of the most "weighty" commandments were the "hefty, hefty, hefty" ones. What commandment was #1, the big boss with the hot sauce. Lewis L. Austin, in This I Believe, wrote: "Our maker gave us two hands. One to hold onto him and one to reach out to his people. 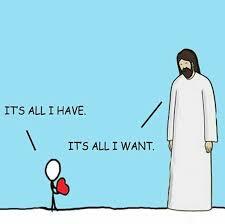 If our hands are full of struggling to get possessions, we can't hang onto God or to others very well. If, however, we hold onto God, who gave us our lives, then his love can flow through us and out to our neighbor." At the entrance to the harbor at the Isle of Man there are two lights. One would think that the two signals would confuse the pilot. But the fact is, he has to keep them in line; as long as he keeps them in line, his ship is safe. It is the same with these commands of Jesus: love of self, the love of God, and love others. When we keep them in line, we remain safe and well in the channel of the Christian life. Jerry L. Schmalemberger, When Christians Quarrel, CSS Publishing Co., Inc.
"Give it to me in a nutshell" -- an old saying -- it means, Tell me what I need to know, but keep it short. Don't bother me with unnecessary detail. Don't bore me with a long, technical explanation. Just get to the bottom line. We like things short and sweet. Network television news has time only to hit the high spots and to show us a few pictures, but it gives us the big picture in a few minutes. We like that. I used to have to sit through weekly staff meetings. Sometimes they would go on for two hours, because everyone wanted to have their say. Then we got a new boss who limited each of us to one overhead slide. Each slide had about ten lines, so each person could show us the status of ten programs -- max. We had to code each program green, yellow, or red. Green meant that everything was o.k. Yellow meant that there was a problem. Red meant, "The sky is falling!" Furthermore, we weren't to ramble. Stand up! Speak up! Shut up! Sit down! I loved it, because we got through the meetings quickly, and I could get back to work. Give it to me in a nutshell! That's what the lawyer said to Jesus -- Give it to me in a nutshell. At least, we think that's what he meant. "Teacher, which commandment in the law is the greatest? Do you know, or should I call Pew Research?" Love is not blind. Love is the only thing that sees. In order that we may know how to love ourselves, an end has been established for us to which we are to refer all our action, so that we may attain to bliss. For if we love ourselves, our one wish is to achieve blessedness. Now this end is to cling to God. Thus, if we know how to love ourselves, the commandant to love our neighbor bids us to do all we can to bring our neighbor to love God. This is the worship of God; this is true religion; this is the right kind of devotion; this is the service which is owed to God alone. The love for equals is a human thing -- of friend for friend, brother for brother. It is to love what is loving and lovely. The world smiles. The love for the less fortunate is a beautiful thing--the love for those who suffer, for those who are poor, the sick, the failures, the unlovely. This is compassion, and it touches the heart of the world. The love for the more fortunate is a rare thing--to love those who succeed where we fail, to rejoice without envy with those who rejoice, the love of the poor for the rich, of the black man for the white man. The world is always bewildered by its saints. And then there is the love for the enemy--love for the one who does not love you but mocks, threatens, and inflicts pain. The tortured's love for the torturer. This is God's love. It conquers the world. Edgar Guest, a renowned American poet at the turn of the century, tells of a neighbor by the name of Jim Potter. Mr. Potter ran the drug store in the small town where Edgar Guest lived. Guest recalled that daily he would pass his neighbor and how they would smile and exchange greetings. But it was a mere casual relationship. Then came that tragic night in the life of Edgar Guest when his first born child died. He felt lonely and defeated. These were grim days for him and he was overcome with grief. Several days later Guest had reason to go to the drug store run by his neighbor, and when he entered Jim Potter motioned for him to come behind the counter. "Eddie," he said, "I really can't express to you the great sympathy that I have for you at this time. All I can say is that I am terribly sorry, and if you need for me to do anything, you can count on me." Many years later Edgar Guest wrote of that encounter in one of his books. This is how he worded it: "Just a person across the way -- a passing acquaintance. Jim Potter may have long since forgotten that moment when he extended his hand to me in sympathy, but I shall never forget it -- never in all my life. To me it stands out like the silhouette of a lonely tree against a crimson sunset." I come to end of my life's journey. But I really don't care if someone remembers me for that. I really don't. I do hope that people are able to say of me at the end of my life's pilgrimage: When we were sick he came to us; when we needed help, he was there; when I was down, he lifted me up. In short, I hope that my ministry is remembered for simple acts of kindness. For if that is the case, then my life would have been worth it and I might have come close to fulfilling the greatest commandment in life: Love God and love your neighbor. A man once observed a young boy out in a field flying a kite. He noticed that there was something odd about the way the boy was standing and holding on to the string. He walked up to the boy and then learned that the boy was blind. He said, "Do you like flying kites?" The boy said, "I sure do." This piqued the man's curiosity and he asked, "How is that when you cannot see it?" The boy answered, "I may not be able to see it but I can feel it tugging'!" We may not always be able to identify the love of God in this world. Like the little boy, we may not be able to see love but it has a tug that lets us know it is there. "By loving the unlovable, You made me lovable." There is a story about a man who had a huge boulder in his front yard. He grew weary of this big, unattractive stone in the center of his lawn, so he decided to take advantage of it and turn it into an object of art. He went to work on it with hammer and chisel, and chipped away at the huge boulder until it became a beautiful stone elephant. When he finished, it was gorgeous, breath-taking. A neighbor asked, "How did you ever carve such a marvelous likeness of an elephant?" The man answered, "I just chipped away everything that didn't look like an elephant!" If you have anything in your life right now that doesn't look like love, then, with the help of God, chip it away! If you have anything in your life that doesn't look like compassion or mercy or empathy, then, with the help of God, chip it away! If you have hatred or prejudice or vengeance or envy in your heart, for God's sake, and the for the other person's sake, and for your sake, get rid of it! Let God chip everything out of your life that doesn't look like tenderheartedness.